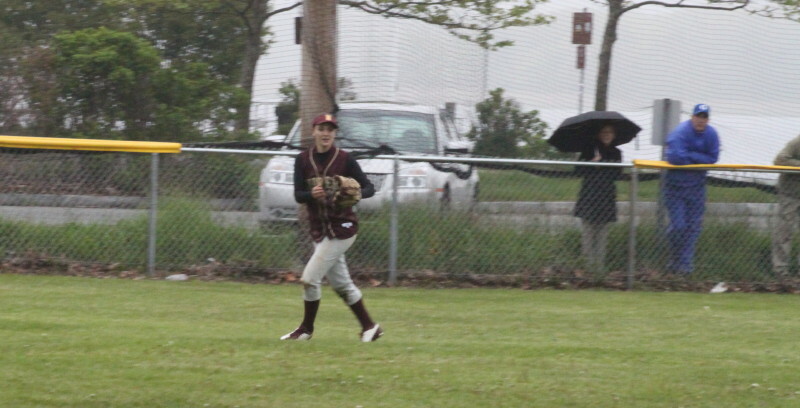 Centerfielder Eleni Kacher relaxes after catching the final out in Newburyport’s win over Masco. Molly Rowe – retired eleven of the last twelve batters in a complete game win. (Newburyport) The Newburyport softball team defeated Masconomet, 7-3, on Monday afternoon at overcast Cashman Park in Cape Ann League action. Newburyport (13-3) continues to roll along. They’ve won ten of their last eleven games. Masconomet (4-12) continues to roll along as well but unfortunately for them it is in the opposite direction – they’ve lost eight of their last nine games. 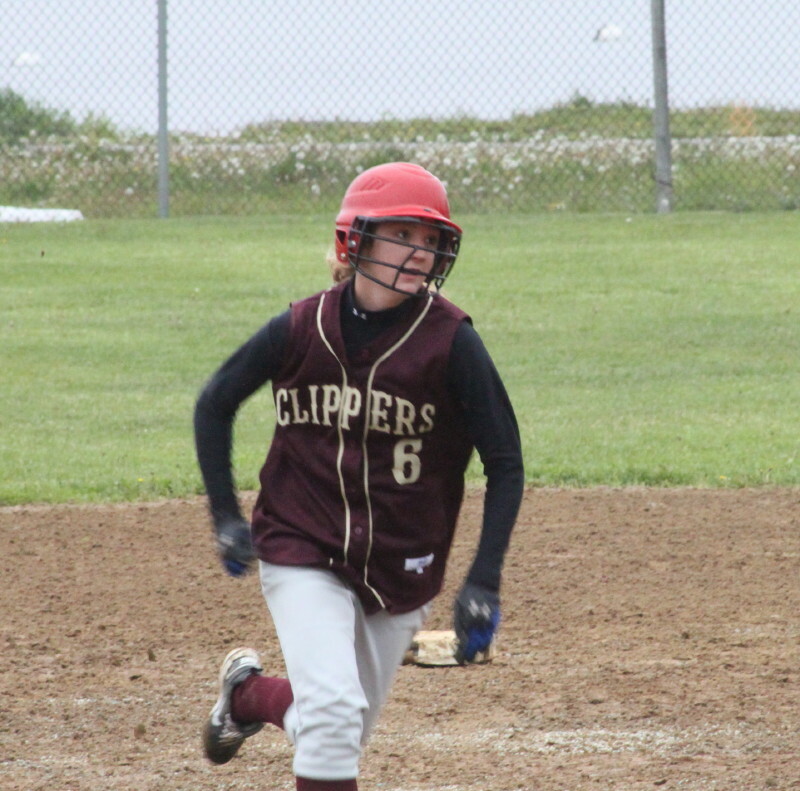 The Clippers stacked up five runs in the second inning to recover from a 1-0 deficit and that was enough as Molly Rowe limited the Chieftains to four hits over the last five innings. Molly had five strikeouts and retired eleven of the last twelve batters she faced. Newburyport was hitless in their first inning but erupted for twelve hits off of Masco pitcher Molli Marshall the rest of the way. Other than the five-spot in the second, the Clippers had solo runs in the third and fourth. 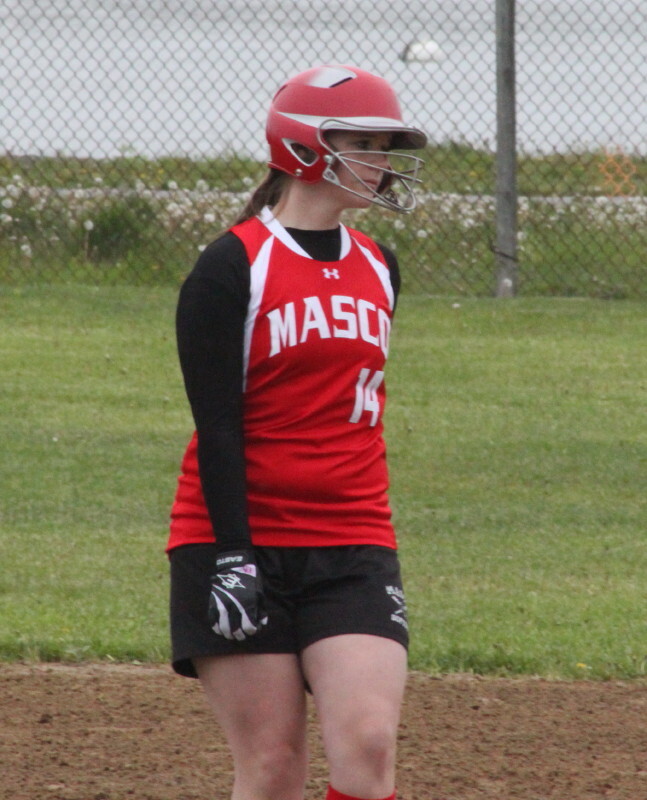 Masco picked up two runs in the 4th and then their bats were nearly silent the rest of the way. Kendra Dow – Clipper shortstop had three hits and scored two runs. Kendra Dow led the Newburyport attack with three hits while scoring two runs. Cassie Davis, Shannon Brunault, and Rachel Webster each had two hits. Julia O’Reilly and Kiki Brown collected half of Masco’s eight hits between them. Julia’s first hit in the top of the first was a well-placed bunt that attracted the attention of pitcher Molly Rowe and first baseman Rachel Webster. Unfortunately, for Newburyport, no one was covering first and it turned into a hit. Two hits later the Chieftains had a run (RBI by Molli Marshall) and runners on second and third with one out. However, Molly Rowe K’d Taylor Evans and handled Lissa Rescigno’s grounder to get out of the jam. 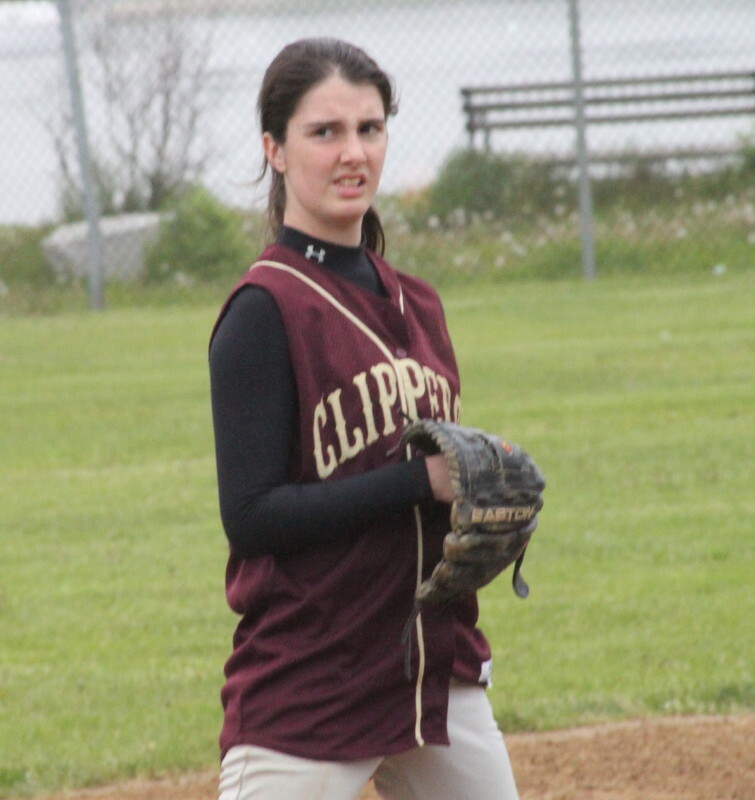 In the Newburyport second, the Clippers mixed five hits together with a throwing error by third baseman Julia O’Reilly. Newburyport batted around in the five-run outburst. Shannon Brunault, Rachel Webster, Maddy Stanton, and Lea Tomasz had RBI. The Clippers picked up their 6th run in Inning #3. Kendra Dow singled, went to second on a wild pitch, and to third on Taylor Summit’s single. She came home on shortstop Taylor Evans’ throwing error. 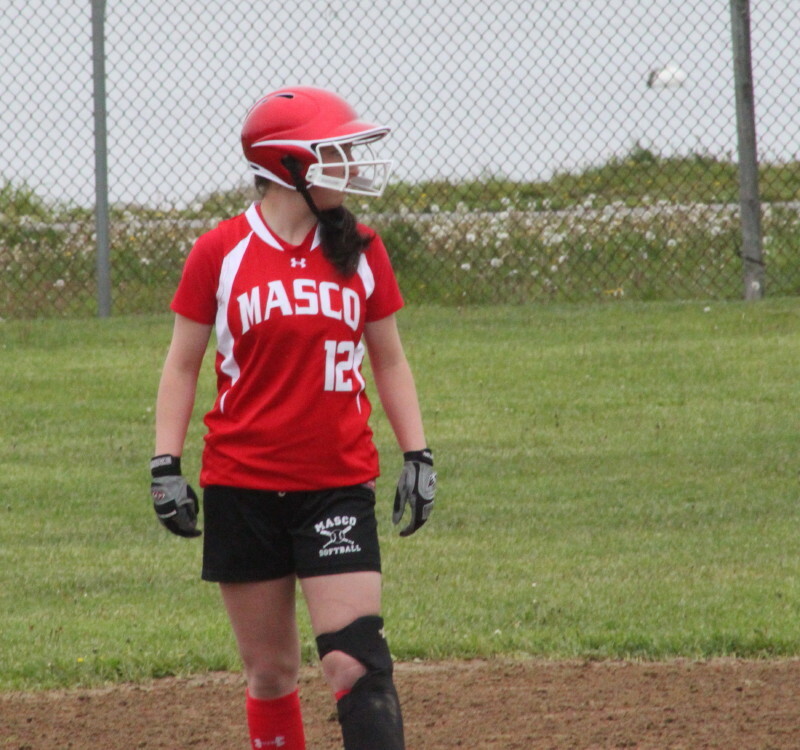 Masco tallied two runs in the fourth inning. A walk (Lissa Rescigno), a hit (Kiki Brown), and a sacrifice bunt (Courtney Gotts) put runners on second and third with one out. Third baseman Maddy Stanton decided to go home with Samantha Martin’s grounder and was too late to get Lissa Rescigno. Julia O’Reilly’s single to left brought Kiki Brown home with the second run. 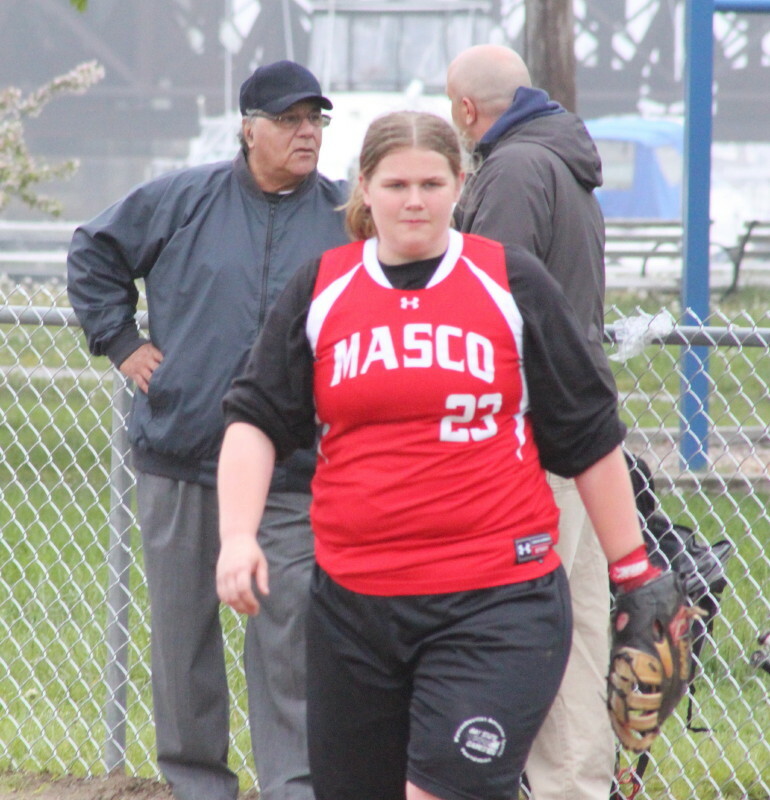 Still threatening with runners on second and third, Molly retired the next two hitters to limit the Masco damage. Newburyport got a gift run in the bottom of the fourth. Cassie Davis singled, went to second on a passed ball, and reached home on third baseman Julia O’Reilly’s 2-base throwing error. NHS coach Peter Murray was heavily into landscaping the Cashman Park field when I arrived early. He made the usual puddles disappear. What can you say about the weather! The good news during this game was that there was no wind and it didn’t actually rain. Bringing an umbrella to a game this season has been almost as important as trying to guess which of the three home fields the Clippers will be playing on. Molli Marshall was just about the most relaxed pitcher I’ve seen. She was carrying on conversations even while she was pitching! After a missed popup by her third baseman Julia O’Reilly, who was wearing a mask, Molli said, “Take off the mask and let them see the dye job!” Comedy Central material! Clipper shortstop Kendra Dow continues to impress with her strong, accurate throws. I learned that she grew up throwing a baseball rather than a softball. I’m still looking forward to Wednesday’s game at Amesbury between the Indians (16-1) and the Clippers (13-3). The Indians were beaten by North Reading on Saturday. 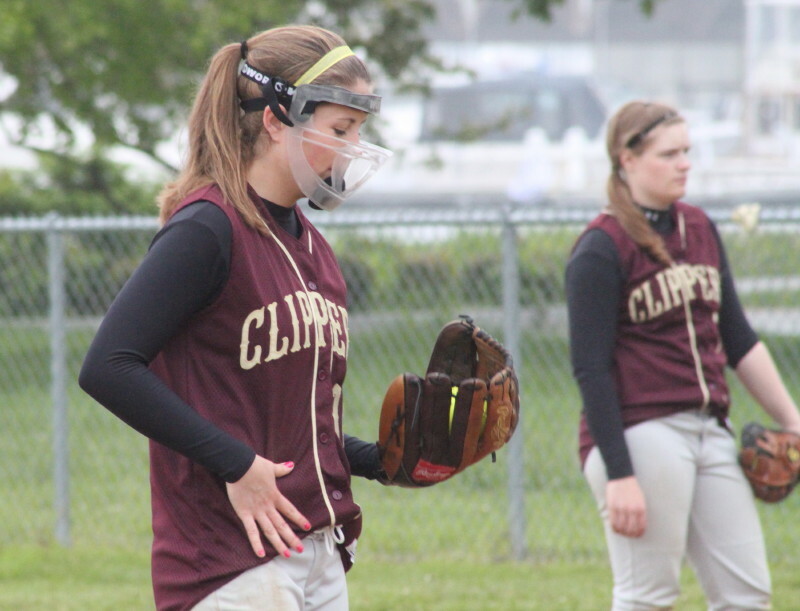 The Clippers lost, 10-9, in their earlier non-league meeting with Amesbury. Both teams have qualified for the post-season. At stake could well be a share of the CAL Division 2 title.